Dedicated to identifying aircraft throughout Movies, Television, and Video Games! As many of you have noticed, The Internet Movie Plan Database (impdb.org) has recently had a hard time keeping up with the growing demands of our users. In 2009 when a couple of us got together to begin putting the website together, space was never an issue. In fact, it has steadily grown with virtually no problems throughout the years. In about the middle of 2016 we began to run into server space issues. We have since made upgrades (moving to a VPS, buying more space, etc), but the site continues to outgrow the upgrades. The meager ad revenue generated by the site isn't sufficient to cover the annual cost of running the server. We who manage the site have never made money from it, it has only ever earned enough money to cover actual server costs. In an effort to continue serving the needs of aviation enthusiasts around the world, we are asking for donations to keep this site up and running consistently like it did when it was a smaller, newer site. If you've enjoyed this website and would like to see it continue being the site you go to for your aviation screenshot needs, please consider donating. 18 Re: sixcyl wiki problems. Help! 33 Recent Category : say again ! 38 Thanks for the Tip ! 46 Bis zum Horizont, dann links! 47 What is a Lockheed L-749 -79-46 ? 48 Stop Blanking Pages ! Thanks for joining The Internet Movie Plane Database Sixcyl! I was wondering if you would sign up. If you feel you can contribute to the site and stick to the format we are currently using, I know that the viewing community, including myself and the other users would be very appreciative of anything you can do to help. There is a new users page which you can use to make the site easier to use as well. Also, the new forum is a great place to publicly discuss things. If you have any questions, comments, or concerns, please feel free to email us at support@impdb.org. Tleeg has made me aware of your post on the imcdb forum. Hopefully this will clear up some points. Completed film pages should be published on both the Movie List and Movies list. How to do this is explained in the Finished Page section. You can rename your file by typing what ever you want in the 'Destination filename' box on the upload page. Once you've selected the file from your hard drive it automatically puts the file name in the 'Destination filename' box, but you can change this to whatever you like. I did edit your comments slightly on the Rockwell Sabreliner section, mainly just removing your username. 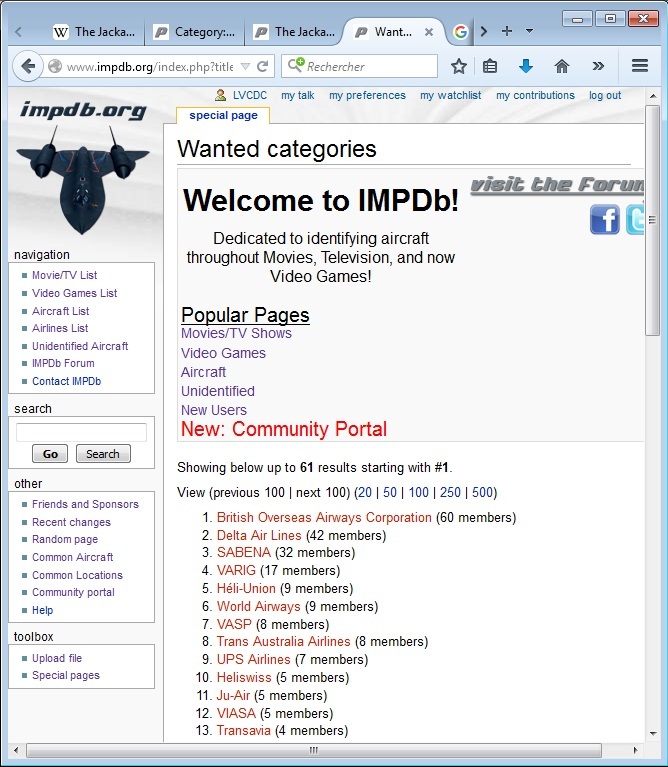 IMPDb is a community project, and should remain like that on all published pages. Any contributions are accredited on the 'history' page. You are free to write any comments about the page on the discussion page, and are encouraged here to add you username to a post. For your comments on Contact, I didn't remove them completely, but moved them to the discussion page. However, as you have brought up the issue, I am happy to review my edits and have reinstated your comments, albeit slightly edited in line with what I said before. I do hope you continue to contribute to IMPDb, as you could be a great help. If you have any more problems or issues, feel free to contact me. Thanks a lot for your help with some of these more difficult planes. The information is greatly appreciated! Sorry if it seems to have taken awhile to update the movie pages with the new info. I now have them all updated. Hopefully I got them right. It's great to see you doing so much! I've tried to address all the issues you've brought up and have also made some minor edits to others bits and bobs. If you haven't already seen it, there is the recent changes page where you can see an overall picture of the recent changes on IMPDb, so see if anyone has changed or commented on something on pages you've worked on. Also please don't be offended by any changes i may have h!!! made to your contributions, I'm just trying to keep IMPDb to the highest standard possible! It's great to see you interested in developing your editing skills. For the aircraft categories, it was agreed, or not contested that links only be created if the category exists - or should exist due to its appearance in another movie. Not sure about the copy/paste problems. Feel free to fill any blank movies - unless there is an note saying otherwise. Ok I didn't noticed the rule about number of pictures/aircraft. I'll will limit them then. Do you want me to delete some of them in the few film concerned by? If you don't mind, that would be great if you could delete some that put it over the 5 per aircraft rule. Even on some of my own film pages, you may notice I have gone back in and taken some of the screenshots out and transplanted them over in the Additional Pictures section of the forum. I have decided to do it this way because I want the site to be clean and uniform and yet I don't want to leave anything out. Save the best for the wiki and the rest for the forum. I was just curious what your thoughts were on this edit: The Mummy Edit. I always take out that spacing. I don't know if it even makes a difference. Yes I did add my email adress. Re: sixcyl wiki problems. Help! Yes, it's quite long, indeed. Thank's. but the way that I have changed it to, for unidentified aircraft..could you give an exemple maybe? At least one of the reasons it's important is to make it easier for future users to understand when they go to look at the source code or edit page. Thanks Tobin. I try to do my best, but I'm not sure to understand all what you mean? edit spacing ...what do you mean? lowercase the word "movie" ... Ok, I understand you want to read movie not Movie. I'll pay more attention next time. ...you never add a period at the end Sorry, but I really don't understand what you mean by period? do you mean "point"? I'm very sorry to bother you, but could I ask you about one of your posts on IMCDb.org? The thing is, you once posted a number of images of cars from the movie 'Scusi, lei è normale?' (here is a link to the page: ). I have been trying to find this movie for a long time, but I can't find it anywhere. Because you posted so many images from this movie, I wondered if you might know where I could find this movie, either to buy or download. I would have contacted you on the IMCDb site itself, but I couldn't find any way to send a message to a member directly, so I looked for your username on google and found your account here. since 2010 i'm totally ignored: My contributions are deleted, lost, my pictures deleted, the cars of my county ignored/mocked, when i'm erroneus in any comments, i'm insulted and unrespected, when viceversa was totally different. My job, my time, and the movies of my country are ignored and none interested in the reasons of some cultural things of "South America" when i explained the "rude" and chauvinism of brazilian people, I was harassed and rejected by all (when in reality, I could try, and I'm right). When i arrived in the late 2009 (december, i remember) appears few argentinian movies and just 35 cars from argentinian origin and few pages with cars made here. Today, 929 cars from Argentina and near 65 pages with argentinian-made cars. An incredibly hard job, no? Episode counts and years active should not be included in cast details. Pages should not be sectioned by Episode, only Season. This keeps the formatting of the aircraft titles the same and prevents excessive repetition - an aircraft could appear in multiple episodes. It is also unnecessary given that the episode details have been included for each aircraft anyway. Comment (if wanted) under the episode number and title. Registration XXXXX, c/n XXXXX if visble on the aircraft. Looks great, I've updated the New Users guidelines to mention about the name and title and given Magnum, P.I. as an example. I've also updated the Page Template with a section for TV Series'. Entre les rediffusions et Pluzz.fr, tu ne devrais pas avoir de mal à la regarder. L'objet n'est pas uniquement l'aviation mais on y voit quelques beaux extraits et on y apprend que rien que pour l'Air Force, Hollywood réalisa 400 films (la plupart d'instruction, certes... mais cela nous en laisse pas mal à traiter ici !). BTW : why did you change the category Breguet Br.1150 into Breguet Atlantic ? The type number is common to both Atlantics and Atlantiques but the new page is exclusive to the older ones, isn't it ? Hi, what's the reasoning behind your changes to the category names? Whilst a hyphen may be appropriate for some e.g. Fairchild-Republic as the name comes from the combination of the both, the majority shouldn't include a hyphen as it is the company name e.g. Fairchild bought Hiller and the name was changed to Fairchild Hiller, who then produced the FH-1100. There is a simpler and better solution - we can specify how the list is sorted - see my example with Fairchild Hiller. I would suggest reversing the previous changes then I can implement the sorting. Recent Category : say again ! I don't understand why on Johan Falk: De fredlösa the Cessna is given a category which doesn't exist and in which it's the single movie ? Well ... So I search among Wikipedia (http://en.wikipedia.org/wiki/List_of_aircraft_registration_prefixes) : "Actually Cyrillic-script for SSSR" (without sourcing this). It works not yet fine but full size pictures could be displayed at reduced size. You just need to PREVIEW one or two times. If it fails, reloaded the picture(s) which resist. Or read the forum here :  (Rush's messages). LE 22 juin, tu as constitué cette catégorie que tu as juste ajouté dans les pieds de page de "ces merveilleux fous volants" et de Bulman. Les sections elles-même n'ont pas été modifiées. La fiche n'est pas rédigée. Je comptais la compléter mais m'aperçois que ce sont des modèles I et IV forts différents. Les regroupe-t-on ou pas ? Il me semble que tu as aussi créé la catégorie de l'Eole (page non rédigée). Avec un beau dilemne : le documentaire Air France parle de l'Eole mais montre l'Avion ! Alors .... ?! Hi Sixcyl, based on you latest contribution (Roissy Charles de Gaulle: embarquement immédiat), I need to insist that you follow the site's guidelines on number of images and limit the number of separate sections for aircraft. For example, there are multiple sections for "Airbus A320-214" when just one section, with a picture of each of the different liveries would be best. The Air Europa 737-85P is an example of excessive numbers of pictures - more pictures doesn't add value to the page, but just makes it longer and less interesting. 5 pictures is the maximum, not the recommended. The reason the site keeps going offline is we are using too much data storage, so we need to limit the amount of data on the site. Airlines Categories are on the track ! RLM NEVER used a dash between the two letters manufacturer code and the type number. All German manufacturers are OK except Junkers. In fact, new categories are built taking care of this rule and we just need to correct Ju 52 / Ju 86 / Ju 87 and Ju 88. Yes ! that's a lot of work but there is no reason to continue an error and increase the future load of changes. I'm trying to correct those categories but two are locked (Ju 86 and Ju 52). So I'm doing the changes for the Ju 88 and I noted a "FSA / Common Aircraft" link on the first movie. So I went to change it but the second movie has no Ju 88 ! Wrzesien - tak bylo... ... did you forget an upload on this movie page ? or is it a mistake on the "Common Aircraft" page ? (update [14:03]) Real link found and change done. It was The Story of Aviation. you changed several categories but why Handley Page H.P.42 and Handley Page H.P.45 and Handley Page H.P.W8B are in red on the "FSA / Common Aircraft" page ? In the same way, I'll follow BtheBest whish and correcting Tupolev's category pages to put the ANT title instead the customer (mainly the VVS) usual name. At least, as changes are time consuming, FUTURE new categories will be built under this rule and the three older ones changed later (i.e. Tupolev SB, TB-1 and TB-3). Gasp ! The problem is not the melting of civil / military aircraft (think to all these C-47, UH-1 and many other transport craft ... or Warbirds now under civil registration). Where do we post a craft seen first under a roundel then with a civil registration ? I think it will be better to split between props / jets, isn't it ? What is a Lockheed L-749 -79-46 ? Hey, I just want to clarify the names of some future airline categories with you, so we can avoid having to go back and change things, especially for some of the bigger ones. KLM - Should we just do KLM, or KLM Royal Dutch Airlines? Northwest Airlines - Should we split Northwest and Northwest Orient into two separate categories or keep them together in one? SAS - Should we separate Scandinavian Airlines System and Scandinavian Airlines? For KLM case, I think it would be better to use KLM alone rather than KLM Royal Dutch Airlines, which cover only post WWII period, after the branding as Koninklijke Luchtvaart Maatschappij before WWII. The case of Northwest is tricky, the codes IATA/ICAO/Callsign remain the same between the 2 namings, but I find more attractive to share the 2 eras , and I'd go for separates categories Northwest Orient Airlines and Northwest Airlines. The same for SAS, though I would use Scandinavian Airlines System name and not SAS. The case of Pan Am, will be interesting too. I think we shall have to share between PAA era Pan American Airways System and Pan American World Airways era. TWA will also be separated between the early era Transcontinental & Western Air ' and later Trans World Airlines. How to be efficient without the final touch of BtheBest ? And to do more easily changes in movie's title ? Just think to use the MOVE tab instead to create a new page, paste the old one, copy data in the new one then blannking the old one ... which is still on lists. The MOVE do all-in-one action. And avoid such "twins" : La chance. and La chance. j'ai annulé ta proposition sur ce film. Je n'avais pas précisé qu'il s'agit de la même séquence à deux / trois secondes d'intervalle. J'ai collé à la discussion du film le lien d'un extrait Utube où l'on cette scène fugitivement (et en surimpression pour ne rien arranger !). Since nearly ten days, I experienced several times a day this message : "this Wiki has a problem". Hey sixcyl, I was wondering if you've any problems uploading new versions of pictures recently? For the last few weeks, whenever I visit the page for a file, I am logged out and can't upload a new version. I noticed you uploaded new versions of some pictures the other day, and am curious if you experienced a similar issue and found a workaround, or just haven't experienced at all. I experienced such problem since end of March (for Squadron 992). In fact, I have a folder with the new movie page on the workbench and a second one to upload the pictures. Once the pix on the database, I copy/paste the code into the template on the first folder then used the 'upload file' link to activate again the other folder (by dropping it). You wrote : 8- Unknown. Some kind of Piper Cub ? But 8 is a low wing airplane, tail dragger : no shadow of a high wing on the fuselage. A high wing plane (Piper Cub ?) 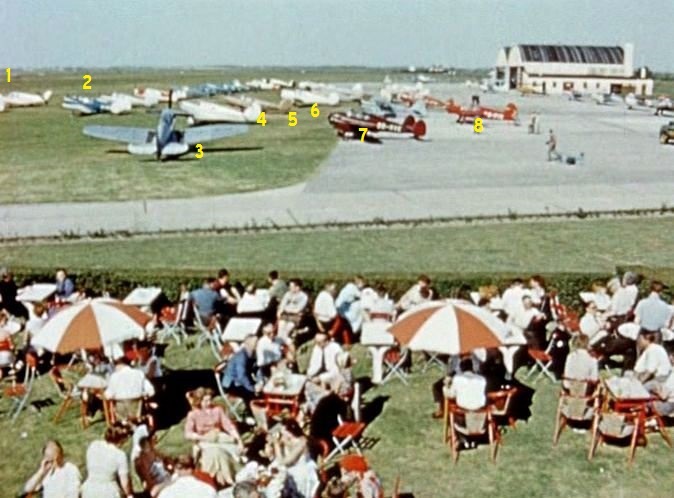 is the blue one behind the number 7 / Miles M.65 Gemini 1A OO-RVE. Hello Dear friends Since yesterday I encounter some dysfunctions of the site. 2- Impossible to upload pictures whatever the picture: aircraft photo, logo ... for ex. with Aeroflot_1.jpg Message in red: Could not store file "/tmp/php0zTiTl" at "mwstore://local-backend/local-public/1/10/Aeroflot_1.jpg"
This page was last modified on 24 February 2019, at 03:10.